1. Finally a day without the alarm clock, including snuggles with the fam & pups. 2. I am so incredibly thankful that I am not a brunch chef anymore. I love cooking brunch. I just like to leisurely sit and eat it too. As I lay in bed still sleepy eyed, The Velvet Undergrounds ‘Sunday morning’ lyrics pop into my head quite regularly. Thus its time to flip on the tunes, and make some pancakes! Not a bad way to start the day. Since I became pregnant I haven’t had many odd cravings at all. No pickles, non of the non vegan things people mentioned I would crave. Except for one thing. Pancakes. I have always been more of a savory breakfast person, but the little one inside screams for fruit topped pancakes weekly. And who am I to deny that. 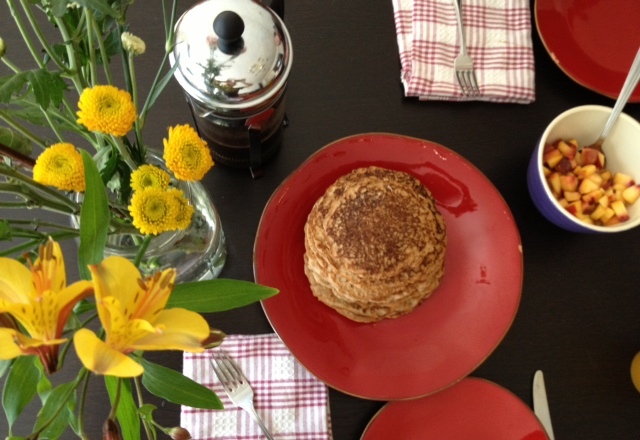 So here is a pancake recipe I adapted from Candle Cafes recipe, and changed a bit to be a little more whole foodie. We skipped out on the blueberry ‘butter’, and opted for just some fresh peaches, and maple syrup. Fresh Fruit, for accompaniment, we had peaches that needed to be used. Put the flour, baking powder, sugar, salt, cinnamon, and ground flax seed in a large bowl and stir to combine. In another bowl, whisk together the coconut milk, coconut oil, and vanilla and add to the flour mixture. Stir until just combined. Spray a large nonstick sauté pan with canola oil cooking spray and heat the pan over medium heat. Drop large spoonfuls of batter into the pan, leaving room for the pancakes to expand. Cook until the bottoms are golden and bubbles are popping to the surface, 1 or 2 minutes. Flip the pancakes and cook the second side until golden. Serve with fresh fruit, and maple syrup. Here’s a close up of the finished cake stack topped with fresh peaches and syrup! They turned out wonderful, and I was glad I didn’t use all unbleached flour. The sprouted spelt flour we used was from a new-to-me company called One Degree Organic Foods. Every grower/farmer who helps make One Degree food products uses veganic growing methods only. How cool is that?! If you haven’t tried any of their products I urge you to. It’s amazing being able to support a company that prides themselves on transparency. Next weekend Erik wants banana walnut, and I’ll opt for blueberries, as Im sure any filling will be wonderful. Maybe even chocolate or carob chips if you feel up to it! Watch out, the world’s behind you. There’s always someone around you who will call. It’s nothing at all. Sunday morning…. This entry was posted in Breakfast and tagged breakfast, brunch, candle cafe, one degree organic foods, pancakes, sprouted spelt, vegan, vegpod, velvet underground. It has occurred to me that I don’t need to write a whole essay on just anything. I mean, blogging is blogging right? So back to breakfast… Sweet? Savory? I’ll take both please. 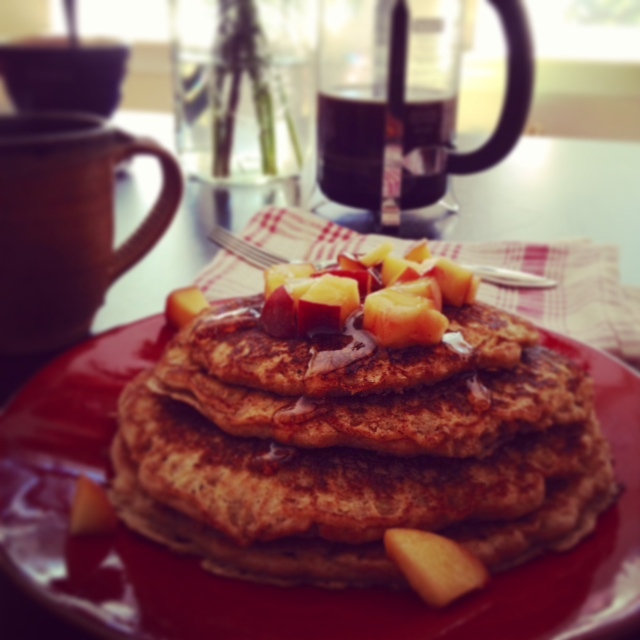 Five grain pancakes, topped with granola, a dollop of homemade vegan yogurt, and some peach compote. And for my savory, some green pea infiltrated tofu scramble, topped with Muir Glen kethup, and house grown-pickled jalapenos. Yum. 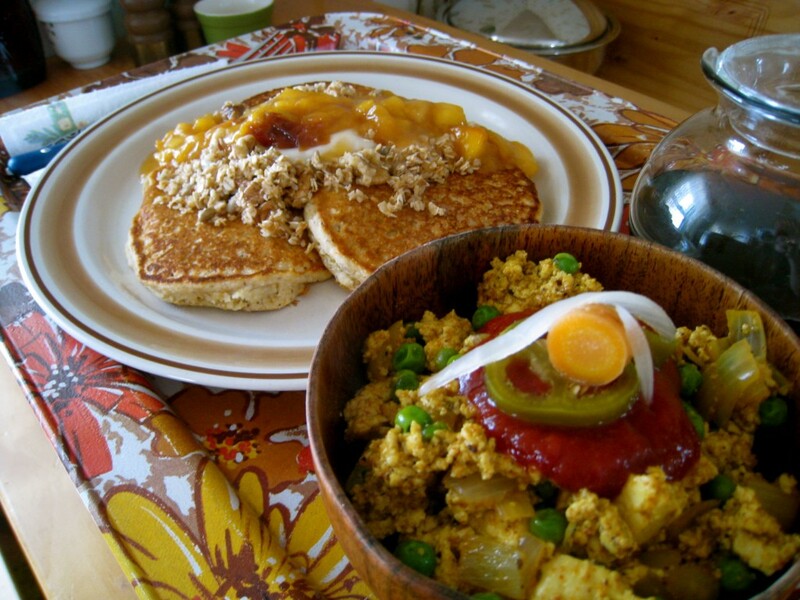 This entry was posted in Breakfast and tagged breakfast, pancakes, tofu, vegan.